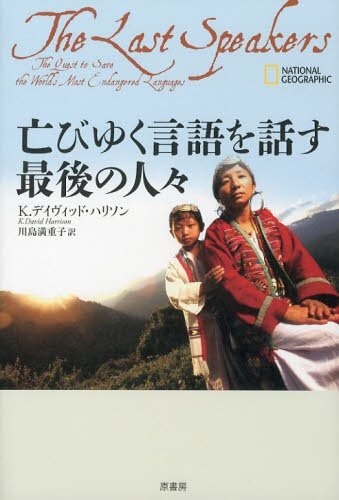 K. David Harrison’s acclaimed book “The Last Speakers” was recently translated into Japanese and published in Japan, which is home to nearly a million speakers of a dozen endangered languages, such as Ainu, Amami, Kunigami, Miyako, and others. Q: What do you hope will be the results of having this new translation available? A: The Last Speakers features personal narratives of “language warriors” from around the world, who are taking heroic measures to save their languages. I hope that the endangered language communities and allies in Japan will find these stories inspiring, and know that they are not alone in their efforts, but are part of a global grassroots movement to save language diversity. To read the rest of the interview, click right here. This entry was posted in Endangered Language Activism, K. David Harrison, Media and Publicity, Support Endangered Languages and tagged ainu, Dr. K. David Harrison, endangered languages, japan, japanese, publication, the last speakers by livingtongues. Bookmark the permalink.